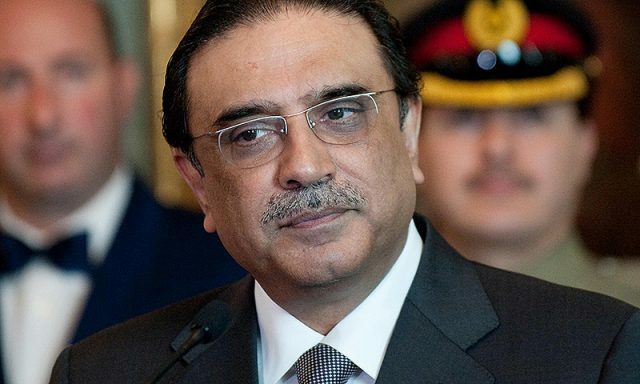 The Pakistan People’s Party will stop the presidential system in the country, said former president Asif Ali Zardari. “We don’t accept the presidential system,” said Zardari, while speaking to the media after appearing before an Islamabad accountability court in the fake accounts case on Tuesday. “Let them make efforts [to install the system in the country]. We will stop them,” he said, saying that the government is in the mood to launch a new experiment in Pakistan on a daily basis, but it will only deteriorate the situation more. Out of the 30 named accused in the mega money laundering case, only 17, including Zardari and his sister Faryal Talpur, appeared before the accountability court. The defence lawyer replied it would be better if accommodations are made available for the accused in the federal capital. They have to travel from Karachi for the hearing, he said. “I have a single government accommodation – jail – and the court may send them there,” replied the judge. The court issued three bailable and one non-bailable arrest warrant (s) for the accused who did not appear before the court. An accused, Iqbal Arain, has passed away, the investigation officer told the court. The judge ordered the authorities to present his death certificate. Two accused, Zain Malik and Shehzad Ali, submitted surety bonds worth Rs2 million each for their bail. The court issued a notice to the Sindh chief secretary over the absence of Hussain Lawai and others, who are on judicial remand. The court granted the investigation officer’s plea for more time to submit the required record. The hearing was adjourned till April 29.